Habit: Annual, erect to spreading, glabrous or sparsely glandular. Leaf: basal, linear to narrow, awns 0; ocreae 0. Inflorescence: terminal, cyme-like; peduncles 0 or erect or reflexed; involucres 1, tubular, teeth (3)4, generally glabrous, awned. Flower: 2--10, glabrous or hairy and glandular; perianth white to rose or green-yellow, lobes 6, entire; stamens 9. Fruit: brown to maroon, generally elliptic, glabrous; embryo curved. Species In Genus: 3 species: temperate western North America, southern South America. Etymology: (Greek: sharp case, for awned involucre) Note: Other taxa in TJM (1993) moved to Acanthoscyphus, Sidotheca. Habit: Plant spreading, 0.6--2 dm, 0.5--4 dm diam. Leaf: blades 1--6 cm, 0.3--1.5 cm wide, glabrous, margins ciliate. Inflorescence: bracts 4--5, fused around node, 1--2.5 cm diam, glabrous or glandular, awns 1--3 mm; peduncles 0 or erect, 0.3--0.8 mm; involucre 2--5 mm, occasionally sparsely glandular, lobes 4, awns 2--3 mm, +- red. Flower: 5--10, 1.5--2.5 mm; perianth white to yellow-green or pink. Fruit: 1.5--2 mm. Chromosomes: n=20. 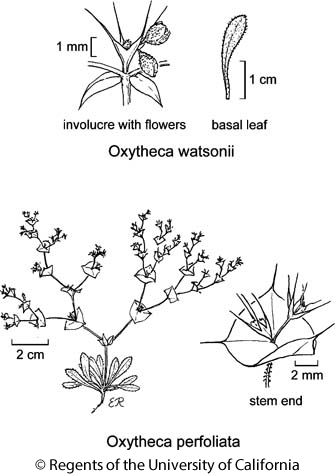 Citation for this treatment: James L. Reveal & Thomas J. Rosatti 2012, Oxytheca perfoliata, in Jepson Flora Project (eds.) Jepson eFlora, http://ucjeps.berkeley.edu/eflora/eflora_display.php?tid=35738, accessed on April 19, 2019.
s SnJV, GB, DMoj; Markers link to CCH specimen records. Yellow markers indicate records that may provide evidence for eFlora range revision or may have georeferencing or identification issues. Purple markers indicate specimens collected from a garden, greenhouse, or other non-wild location.